16th annual Desert Companion Restaurant Awards have awarded Caesars Entertainment Las Vegas resort restaurants four awards. Bacchanal Buffet and Restaurant Guy Savoy at Caesars Palace were awarded based on their cuisine and operations and Gordon Ramsay Steak at Paris Las Vegas was honored for exhibiting the city’s best pastry chef and signature dish. Desert Companion, Nevada Public Radio’s award-winning city-regional magazine, publishes its restaurant awards each year and is a compilation of the most esteemed local food writers and critic’s selections of the year’s masters in Las Vegas culinary excellence. This year marks the third print version and the 16th annual awards list. The annual list is a broadcast tradition brought to print, developed when John Curtas began picking the valley’s best restaurants on Nevada Public Radio in 1997. Gordon Ramsay Steak at Paris Las Vegas hosted this year’s restaurant awards luncheon on Tuesday, Dec. 4. It was the first year Desert Companion held an exclusive gathering to present many of the best chefs and operators in Las Vegas with their awards. The Bacchanal Buffet at Caesars Palace was named by Desert Companion as “Surprise of the Year” expressing, “The early accolades have been numerous, the mind-numbing lines indicate people have taken notice – but the attention to detail makes the Bacchanal Buffet even better than it’s been made out to be.” Bacchanal Buffet’s well-known Executive Chef Scott Green and Manager Gabrielle Perez accepted the award on behalf of the buffet. Since opening in Sept. 2012 the all-new Bacchanal Buffet has gained sizeable recognition and won numerous awards. The 2012 Desert Companion Restaurant Award adds to the existing praise the buffet has received including being named “No. 1 buffet in Las Vegas” by USA Today on Sept. 21, “Best Desserts” in Vegas Seven’s 2012 Restaurant Awards on Oct. 11 and “Stone Cold Stunner” in the 2012 Eater Awards for Las Vegas on Nov. 12. Gordon Ramsay Steak at Paris Las Vegas’ Pastry Chef Steve Yi was recognized by Desert Companion as “Pastry Chef of the Year” affirming, “On a famed street where so many magnificent pastry pros ply their trade nightly, it’s difficult to discover a standout. That this chef complements - and crowns - a terrific and complete experience at this superb new restaurant proves Yi is a star.” Pastry Chef Yi was thrilled to accept his award at the luncheon amongst the most respected operators in the industry. Since its debut in May of 2012, Gordon Ramsay Steak at Paris Las Vegas has been acknowledged for its savory cuisine and popular desserts such as Pastry Chef Yi’s signature sticky toffee pudding. The irresistible dessert and Chef Ramsay’s spot-on beef Wellington have contributed to the distinction of the restaurant’s menu. 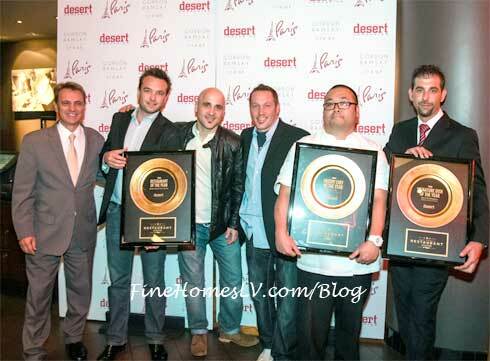 The “Signature Dish of the Year” award was given to Gordon Ramsay Steak at Paris Las Vegas’ famed beef Wellington. Familiar to fans of popular shows, MasterChef and Hell’s Kitchen, the beef Wellington is one of the most prized entrées on the menu. Accepting the award on behalf of the restaurant was Gordon Ramsay Steak’s Executive Chef Kevin Hee. “Ramsay’s version of the seemingly simple, nearly impossible-to-perfect traditional dish [the beef wellington] is more than a new standardbearer; it’s a meaty maturation…One beautiful plate is all it took to change this eater’s impression of what British food can be,” stated Desert Companion. Chef Ramsay’s signature dish is featured on the restaurant’s recently introduced special Hell’s Kitchen seasonal prix-fixe menu. The first 1000 diners who experience the new menu will receive a souvenir folder inclusive of the menu and an autographed photo of Hell’s Kitchen season 10 winner Chef Christina Wilson, Executive Chef Kevin Hee and Chef Gordon Ramsay. Gordon Ramsay Steak at Paris Las Vegas has been named, “One of the 25 Most Anticipated Restaurant Openings in the U.S. for 2012″ by Eater.com/National on March 29, “One of the Top New & Notable Restaurant Openings in Las Vegas for 2012″ by Gayot.com on April 14, ranked #1 on the list of “2012’s 7 Most Anticipated Restaurant Opening in Las Vegas” by Eater.com/Las Vegas on April 19, named “Best New Restaurant” by Vegas Seven’s 2012 Restaurant Awards on Oct. 11 and “One of Ten Best Steakhouses in Las Vegas” by Las Vegas Weekly on Nov. 16. The charming three-man team who accepted the award on behalf of the restaurant were Restaurant Guy Savoy’s executive chef, Mathieu Chartron, senior chef tournant, Alan Mardonovich and restaurant manager, Alain Alpe. The Michelin two-star Restaurant Guy Savoy continues to collect respected accolades to add to its existing recognitions. The elegant French restaurant is a AAA Five-Diamond recipient, five-time winner of Wine Spectator’s prestigious Grand Award, has been named “One of the World’s 101 Best Hotel Restaurants” by The Daily Meal on Aug. 20 and “Best French” by Vegas Seven on Oct. 11. Debuting December of 2012, Gordon Ramsay Pub & Grill at Caesars Palace was called-out in the Gastropubs Trend of the Year section of the restaurant awards. The pub & grill will launch Chef Ramsay’s second restaurant in Las Vegas introducing a contemporary yet casual restaurant and bar serving lunch and dinner and will be located in the heart of the resort adjacent to the premiere entertainment venue, The Colosseum, replacing Bradley Ogden restaurant.